Sony on Monday pushed out a firmware update for its iOS-compatible DSC-QX10/QX100 "lens-style" cameras, adding a half-press to focus function to the device's on-board shutter release, higher resolution MP4 video recording and other minor enhancements. With the added functionality, Sony brings the QX series in line with most other consumer cameras on the market that can activate auto focus by depressing the hardware shutter release to a halfway point. Users can then snap a picture by pressing down fully. 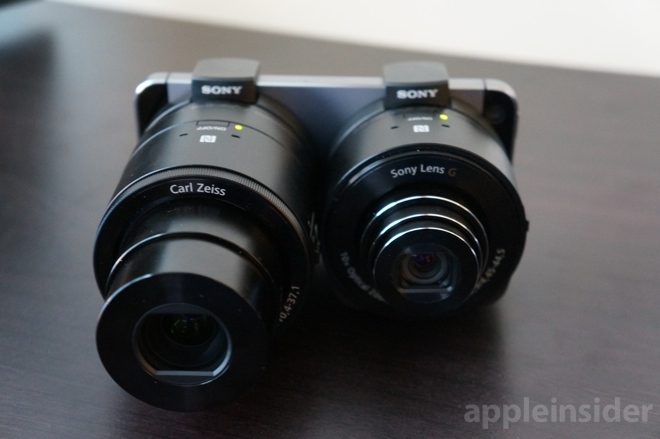 To go along with the new camera firmware, Sony also rolled out a new PlayMemories Mobile iOS app with UI improvements. When the camera is connected to an iOS device, users can touch the screen to focus and release to take a picture. As noted in AppleInsider's QX10 and QX100 reviews, the unit's focus control features left much to be desired, especially when controlling the device through the buggy PlayMemories Mobile app. In addition to half-press focus, Sony has upped MP4 recording size from 1,440-by-1080 pixels to 1,920-by-1080 pixels. Both resolutions are recorded at 30p, or 30 full frames-per-second. The cameras also get a new "S-Mode" shutter priority mode and manual ISO sensitivity from 160 to 12,800. Finally, while it doesn't apply to iOS devices, Sony has included faster "One-Touch" near-field communication pairing for smartphones and tablets supporting the NFC protocol. The QX10 update is a 92.19MB download, while the QX100 firmware comes in at 91.42MB. Sony's PlayMemories Mobile app weighs in at 8.2MB and can be downloaded through the App Store.